Portable table saws are lightweight machines that, you guessed it, are designed to be portable. These are an great choice if you don’t have much room in your shop. It is quite common for portable saws to not come with a stand or legs. 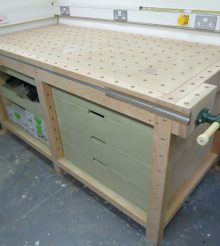 They are designed to either be clamped to a surface or attached to a commercially bought stand, or better still you can attach it to a custom made saw stand that you have designed yourself. Portable saws tend to use lightweight universal brush motors (a lot noisier than the quiet, smooth induction motors, found in some home shop/contratcor and cabinet table saws) . Because of the smaller motors used in these types of table saw, the maximum size blade in these saws tend to be 10 inches. Manufacturers put a lot of effort into keeping the weight of these saws down. They will make use of lightweight, but sturdy materials to ensure that these tools really are portable. The biggest drawback with this type of saw is the size of the table. Due to the small, “portable” size, they are not good for ripping large sheet materials. This can be overcome by added extension wings, but this can lead to you needing to carry more equipment with you and spending more time setting up. 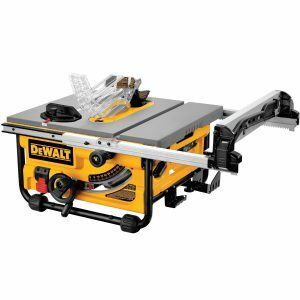 Portable table saws can be a great choice as a starter saw due to their low cost when compared to home shop saw and cabinet saws. And at $299 currently from amazon, it is a great value portable saw. 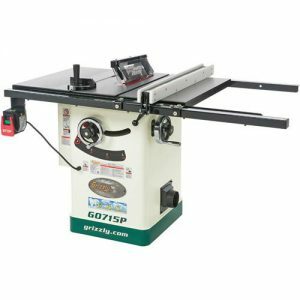 Here is the Grizzly G0661 contractor table saw. you can see it has a much bigger table allowing you to rip large sheets easily. 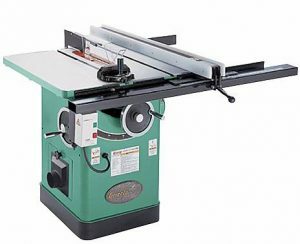 The Hybrid table saw is a relatively new edition to the types of table saw. 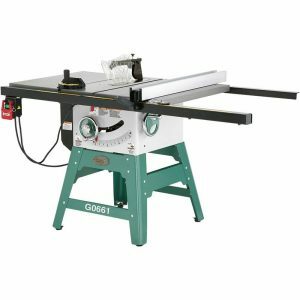 Its place in the market is to bridge the gap between contractor and cabinet saws. If money isn’t an option and we all had the space then a cabinet saw would win hands down. Unfortunately we live in the real world and money does indeed matter, and if we are serious hobbyists rather than professional cabinet makers, then we may find it hard to justify the cost of an all singing and dancing cabinet saw. 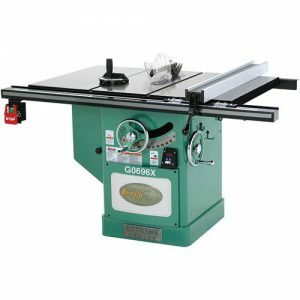 But a lot of us still want a lot of the features that the cabinet table saw offer, That is where the hybrid saw comes in. The motors tend to be in the 1-2 horsepower range and tend to be a smooth and quiet induction motor. The smaller motors allow these saws to fall into the 110v category meaning that they can be used on a domestic supply. Some hybrid saws, come with the full size, enclosed cabinet base, The motor is mounted within the saw, instead of onto the back of the saw. The trunions and arbour bearings tend to be a bit more heavy duty and the drive belt system will tend to be a bit more advanced. You would be forgiven for mistaking a hybrid saw for a cabinet saw as they do look very similar. The cabinet saw is the bigger an heavier than all the rest. It can look very similar to the hybrid saw but can weigh from 200- 600 lbs heavier. The extra weight comes from using bigger, more substantial parts and a much heavier cast iron top with cast iron extension wings. With these bigger sturdier parts you will find that they are machines to much closer tolerances, making the saw a lot more accurate. Being so heavy also reduces the amount of vibration when it is running. Larger beefier parts allows more powerful motors to be used with. Motors in cabinet table saws tend to be induction style motors around the 3-5 hp range. 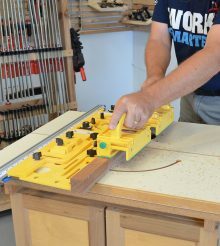 Cabinet saws really do tend to be for the professional woodworker. But if you have the budget and the space, then I say go for it!! Hi James. 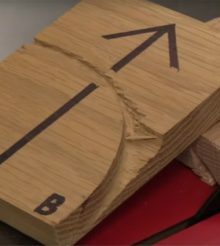 I had no idea such table saws called ‘hybrid’ actually exist. I can confirm, however, that the DeWalt portable saw is a great addition to any professional out there. Plus, it’s not as heavy as I expected from a sturdy, solid table saw.